On Tuesday night you’ll be able to catch multi-platinum megastar Sheryl Crow Live on Letterman. She’ll be playing old songs and new in the surrounds of Letterman’s famous New York set, just tune in at 8pm ET (5pm PT) to watch an hour-long set from the nine-time Grammy winner. And for those who love Crow but can’t catch the event live, don’t worry. The entire show will also be available free on-demand right afterwards. As an artist with 8,667,514 scrobbles and 771,865 listeners, the last six months have seen a lot of jockeying for place among her biggest charting songs. Hits like ‘Everyday is a Winding Road‘ and ‘My Favorite Mistake‘ bubble in and around the top five, though their all-time scrobbles see the latter ahead by 69,389 scrobbles. ‘All I Wanna Do‘, her worldwide chart smash, sits tight at 474,659 scrobbles, but it’s probably no surprise that her all-time most played track is ‘If It Makes You Happy‘. 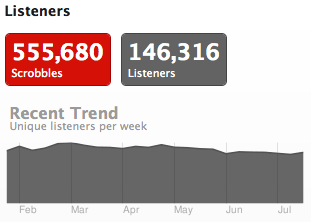 The track has seen 146,316 of you scrobbling it since Last.fm started, with more than two thousand unique listeners every week. It’s clear that the track makes you happy, and we imagine she’s pretty pleased about it too. Visit CBS now to find out more about Sheryl Crow’s Live on Letterman appearance, and check out more from Crow at Last.fm in the sidebar. Meanwhile you can download the audioscrobbler today, allowing every song you play to count every time you play it. Find out more, at Last.fm. This entry was posted in Music and tagged Last.fm, Live on Letterman, Sheryl Crow. Bookmark the permalink.